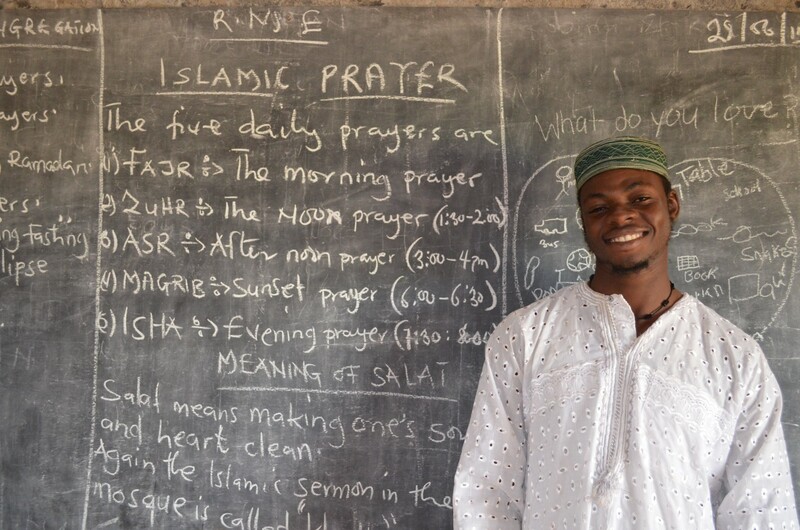 Material prosperity and academic ability do not always go together, as students at a Muslim school in Ghana and an Islamic Sunday School in Chicago found in March when the Ghanaian students beat their U.S. peers in a video conference spelling bee. The 4th- through 8th-grade Ghanaian students in their bright blue uniforms, the girls’ radiant black faces framed by spotless white head scarves, gathered in the cement-floored assembly room of their school. Sunlight streamed in from the gaps between the rough wood planks that make up the walls. Through a Zakat Foundation of America (ZF) service-learning curriculum the students met virtually with U.S. students wearing jeans and sweatshirts in a colorfully-decorated and carpeted classroom and took turns spelling words in English. “Foreign. F-O-R-E-I-G-N. Foreign.” After each correctly spelled word, both groups burst into boisterous applause. The Ghanaian students’ first language is Twi. Arabic and English are their second and third languages, but this did not stop them from defeating their American peers. They spelled 18 words correctly, while the U.S. students spelled nine. A young Ghanaian student closed the spelling bee with a recitation of verses from the Quran. In an earlier video conference, the Ghanaian students had shown their U.S. friends how difficult it is for them to access clean water. When the Chicago students saw this, they resolved to raise money for a water well to be constructed at their sister school. Today, after several successful bake sales, the students have raised half the cost of the water well, and a student-run movie night and pinewood derby race are planned to raise the rest of the funds. ZF service-learning programs teach students about global issues such as water disparity, and how to lead and organize social change. But more importantly, they create opportunities for connections like these to form. The prophet Muhammad (pbuh) taught us that service is always a reciprocal exchange – while receivers get help, the givers gain spiritual growth.